I’ve talked with many of local fish store owners and other friends that have been in the hobby for a long time asking them about suggested fish that are small and stay in tight schools. The standard reply is chromis which come in a variety of color, but they tend to get a large than I am looking for. I’ve been seeking something comparable to the neon tetras of the fresh water world. I just recently read about the Luminous Cardinalfish in another blog. I was excited to see that I wasn’t the only person that has been searching for a small schooling fish. Do any of our ReefTools readers know of other species that fit the bill? If so, please take a moment to make suggestion in the comment area below. 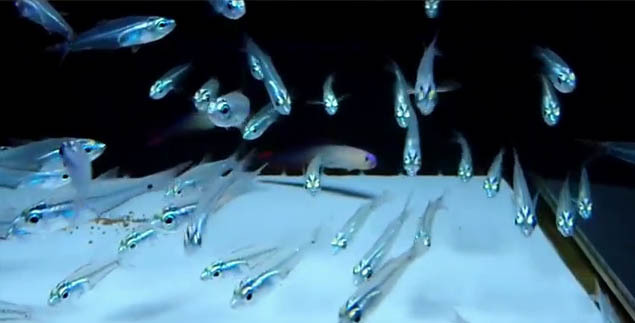 Here is a video of the Rhabdamia gracilis (Luminous Cardinalfish). What blog did you read this on? The suggestion I usually give is threadfin cardinalfish, Zoramia leptacanthus. They’re small (about 2.5″ max, though deep-bodied), peaceful, beautiful in a subtle way, and they do group together. Their silvery-beige bodies develop shimmers of green and rose in the right conditions, and their eyes are blazing sapphire-blue. They do tend to ship badly, but my LFS gets captive-reared (collected as fry and raised in captivity) ones in from Sustainable Aquatics all the time, which apparently do quite well. I think a 50G or bigger species display with big colonies of branching SPS–especially staghorn Acropora or Porites cylindrica–and a shoal of these little fish would be stunning.